Hardin’s Deadly Tools John Wesley Hardin was a master craftsman of death, and these were the tools of his trade. 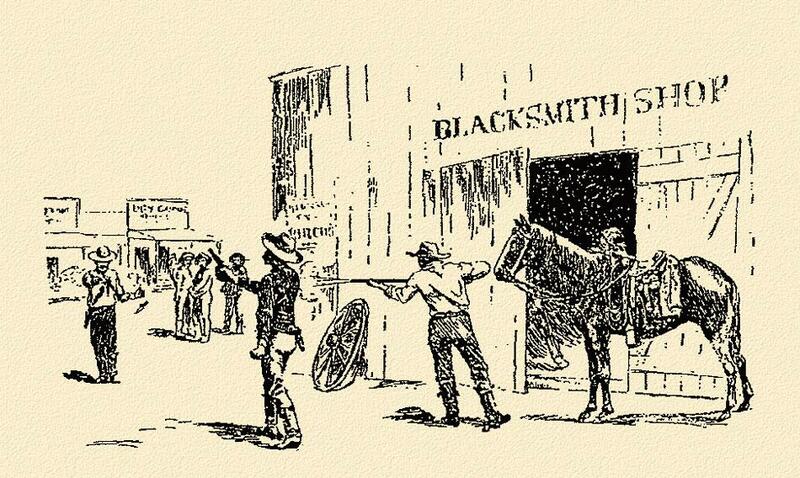 We’ve long held a fascination for the gunmen of the Wild West, and firearms enthusiasts have been especially interested in the hardware used by them. 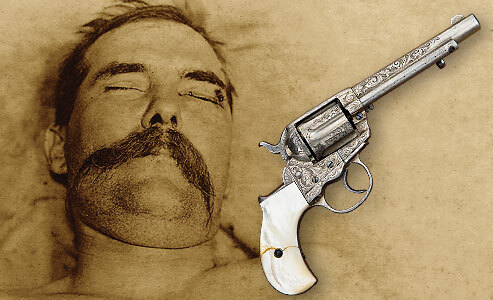 Unlike most Wild West gunmen, who left behind scarce detailed accounts of the guns they had used during their tumultuous careers, John Wesley Hardin is known to have owned or used several solidly documented guns. Hardin, arguably the most deadly of the Old West’s gunmen, was a notorious desperado whose career spanned three decades (minus almost 16 years in prison) that ranged from the end of the percussion era of the late 1860s to well into the age of metallic cartridge arms in 1895. 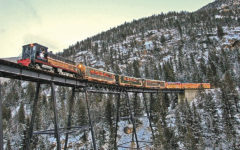 Although firearms were probably nothing more than mere tools to him, there is little doubt that Hardin was a man who appreciated the mechanics as well as every line and curve of his weapons, as his adept handling of his firearms testifies. To say that Hardin was good with his guns would be an understatement. During his lifetime he was considered to be the best shot, the fastest draw, an excellent horseman and the deadliest gunman in the West—and not simply through hearsay. 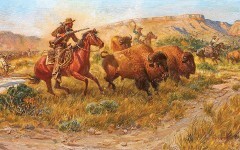 Hard men of arms, who had witnessed and respected his six-gun handling, recorded his abilities. In El Paso, he practiced daily in front of a mirror in his boarding room. He wore a special “calfskin vest with built-in holsters containing his two Colt .41 caliber revolvers,” according to contemporary accounts, although neither this vest, nor a bulletproof vest he was supposed to have worn, have ever turned up. As a final testimony to Hardin’s speed and skill with his guns, El Paso Constable John Selman, a noted gunman himself, would kill Hardin by shooting him in the back! Much of Hardin’s early career—from 1868 to 1877—largely involved the use of cap-and-ball revolvers, since the self-contained metallic cartridge arms were relatively new and were not yet nearly as plentiful as they were in later years. In his life’s story, he frequently makes mention of Colt’s revolvers. Based on the dates of his gunfights, these likely would have been the Model 1860 Army .44s or the 1851 and 1861 Navy models in .36 bore, or possibly cartridge conversions. Hardin is known to have used at least one 1851 Navy .36, which is identified by serial number in a letter handwritten by Joe Clements, Hardin’s cousin. In the letter, Joe writes that Hardin gave him the gun after Joe had broken up a fight in Gonzales, Texas, and that Hardin got a newer model revolver. Hardin mentions using a Colt .44 (most likely the 1860 Army model) in his first killing, in 1868, involving a freed slave who had assaulted him. Shortly thereafter, he may well have relied on the same six-gun when a posse of three soldiers discovered his whereabouts and came to arrest the 15 year old for the shooting. The teenaged fugitive selected a spot by a deep creek bed, where they would have to cross, and waylaid the troopers. Several years later, when Hardin was captured in Pensacola, Florida, on July 23, 1877, he had a ’60 model, .44 cap-and-ball Army Colt revolver on him. He had been unable to draw his six-shooter, since it was strapped to his galluses—much to the relief of the arresting officers. In recounting his many other fracases, Hardin does not go into detail as to the particular type of weapons used. Like many other Westerners of the day, Hardin referred to them as a cap-and-ball six-shooter or, simply, as “my pistol.” Texas’s Public Enemy No. 1 also spoke of shooting a man with a derringer. Again, he doesn’t stipulate the type or caliber, and such a weapon at that time could have been any of a myriad of hideout pocket pistols. One of Hardin’s known six-guns is a Smith & Wesson Model 3 Russian First Model, in .44 Russian chambering, which he used to kill Deputy Sheriff Charles Webb in Comanche, Texas, on May 26, 1874. This shooting brought about Hardin’s eventual capture and jailing. It is perhaps the only documented metallic cartridge six-gun from Hardin’s pre-prison era of lawlessness. Although he preferred handguns, he was known to have also used longarms in several shoot-outs. Beside the above-mentioned incident in 1868, when he used a double-barreled shotgun to kill some soldiers, Hardin also used a shotgun to kill Jack Helm in July 1873. Helm, a former Texas police captain and the DeWitt County sheriff, was also a deadly rival of Hardin’s in the notorious Sutton-Taylor feud. Hardin, who fought for the Taylors, gave Helm a broadside with a British W.&C. Scott & Son, double-barreled, 12-gauge percussion shotgun as Helm approached him. Hardin’s partner, Jim Taylor, then shot the sheriff several times in the head with his six-gun. This Hardin shotgun is on display at the Buckhorn Saloon & Museum in San Antonio, Texas. Rifles also sometimes made up Hardin’s personal arsenal. 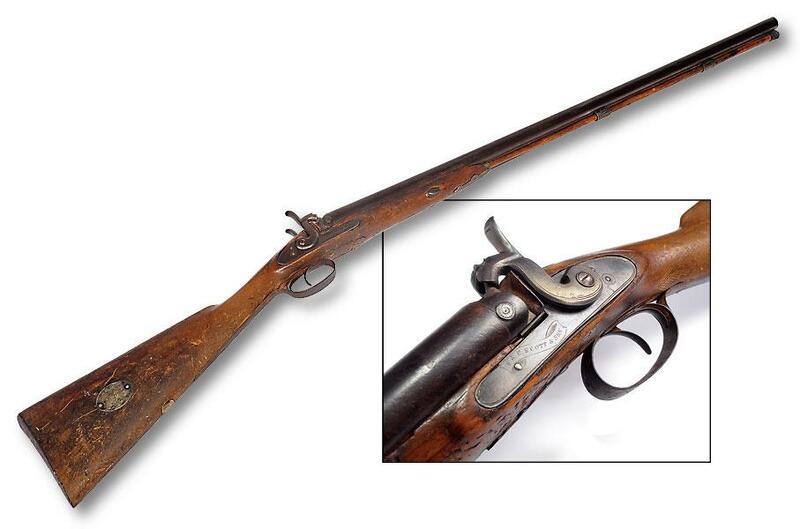 In his autobiography, he gives an account of firing at some pursuing lawmen with a “needle gun,” a frontier term for the .50-70 Allin conversion of the Springfield rifle—an early trapdoor model. After Hardin’s release from prison in February 1894, the governor of Texas granted him a full pardon. Passing the bar soon afterwards (while in prison, Hardin had made an attempt at reforming by studying law and theology), the ex-convict began practicing law. Yet his inner demons were still plaguing him, and the hair-trigger-tempered Hardin quickly reverted to his old ways of gambling and drink. The firearms from this notorious Texas pistoleer’s final years are solidly documented through the official court records resulting from an arrest and his murder. They present an interesting assortment of handguns. Among these was a nickeled 2½-inch, ejectorless, .38 caliber Model 1877 Colt Double Action “Lightning” with two-piece pearl stocks. This six-shooter was presented to him (along with an engraved and gold-filled Elgin pocket watch, a watch chain and coin watch fob) from his cousin by marriage, “Killer” Jim Miller, for representing him in a legal dispute. Hardin also owned two .41 Long Colt-chambered 1877 Colt Double Action “Thunderers.” One was a 4½-inch barreled, ivory stocked and nickel plated pocket revolver (with ejector) and the other had a barrel of five inches and was nickel plated and ornately engraved with two-piece pearl grips. Hardin also owned an ivory-stocked, 4¾-inch barreled, 1873 Colt Single Action Army in .45 Colt chambering, in nickel finish, with the ejector housing removed (quite possibly by Hardin himself, for an easier and faster draw from his pocket). 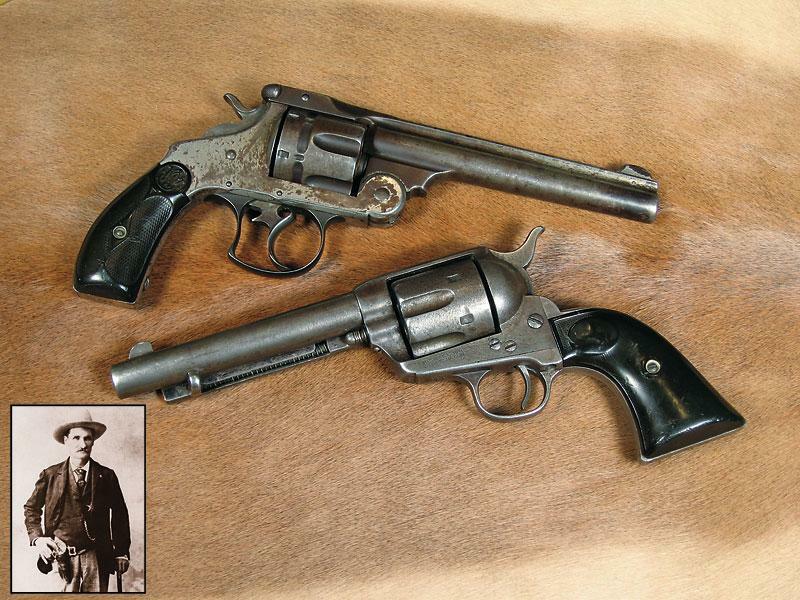 Hardin’s 1873 Peacemaker, as well as one of his .41 Long Colt 1877 Colts (the ivory-stocked 4½-inch model), are on display at the Autry National Center’s Museum of the American West in Los Angeles, California. At the time of his death, 42-year-old Hardin was packing a Smith & Wesson Double Action “Frontier” in .44-40 chambering, with black factory hard rubber grips. On the afternoon of August 19, 1895, Hardin threatened the lives of Constable John Selman and his son. That night, Selman walked into the Acme Saloon in El Paso, where the noted gunman was drinking and rolling dice, and coolly shot Hardin in the back of the head with a Colt .45 Peacemaker, killing him instantly. Had Selman indeed faced Hardin in a fair fight, the outcome might well have been different. J.W. 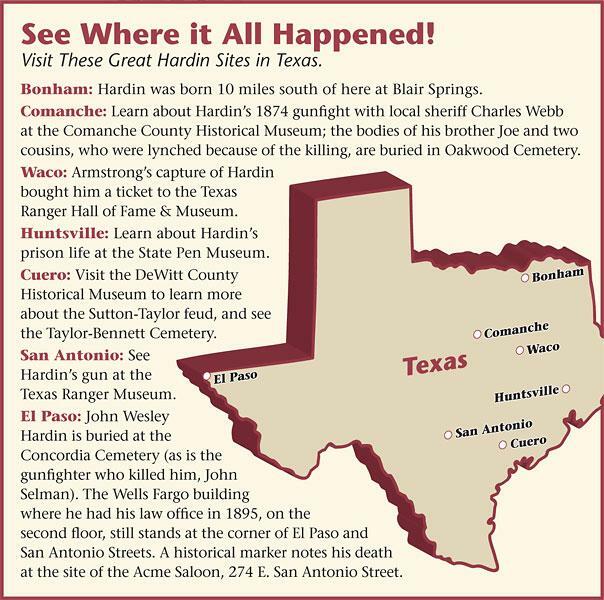 Hardin was a bona fide expert with his six-guns. In his last year of life, he put on a number of shooting exhibitions during which he shot holes in faro cards, then signed them and gave them away as souvenirs. Most historians, including this writer who has carefully measured the bullet holes in some of these cards, feel that Hardin used his .41 caliber Double Action 1877 Colts to perform these shooting feats. 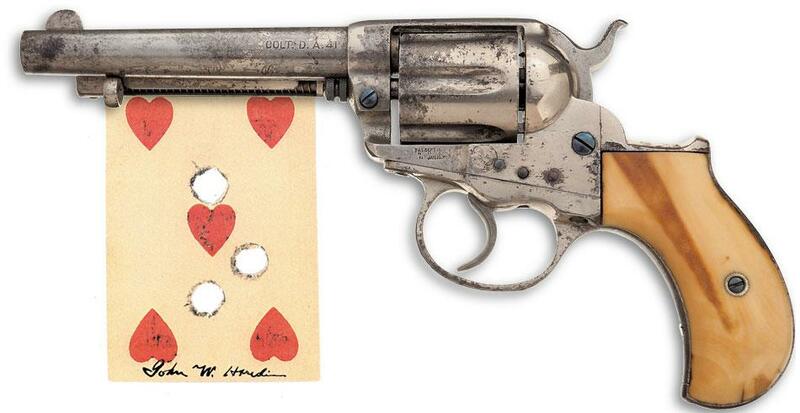 A handful of these unique gunfighter mementos still exist and bring a premium price with collectors, as do any of Hardin’s firearms. Like so many other shootists of the Old West, Hardin had many guns during his long and violent career. Thanks to court records, Hardin relatives and dedicated historians and collectors, like El Paso’s late Robert E. McNellis, who uncovered several of Hardin’s documented guns and other personal memorabilia, several examples of the Texas gunman’s weaponry have survived. These valuable artifacts not only reveal the types of arms used by Old West gunfighters, but also provide the rare opportunity to see the actual tools of this deadly gunman—one of the frontier’s most notorious shootists—in his violent profession. 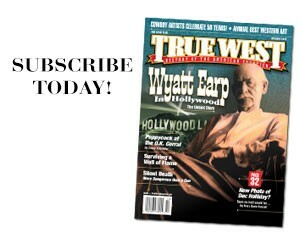 Phil Spangenberger writes for Guns & Ammo, appears on the History Channel and other documentary networks, produces Wild West shows, is a Hollywood gun coach and character actor, and is True West’s Firearms Editor. Although Hardin was an expert pistoleer who used handguns for close range work, he knew the value of a scattergun. This 12-gauge, percussion W.&C. Scott & Son English shotgun was owned and used by Hardin to kill Jack Helm, the sheriff of DeWitt County, Texas, and a deadly rival in the Sutton-Taylor feud, in July 1873. Hardin later gave the piece to Sheriff J.C. Jones of Gonzales County, Texas. 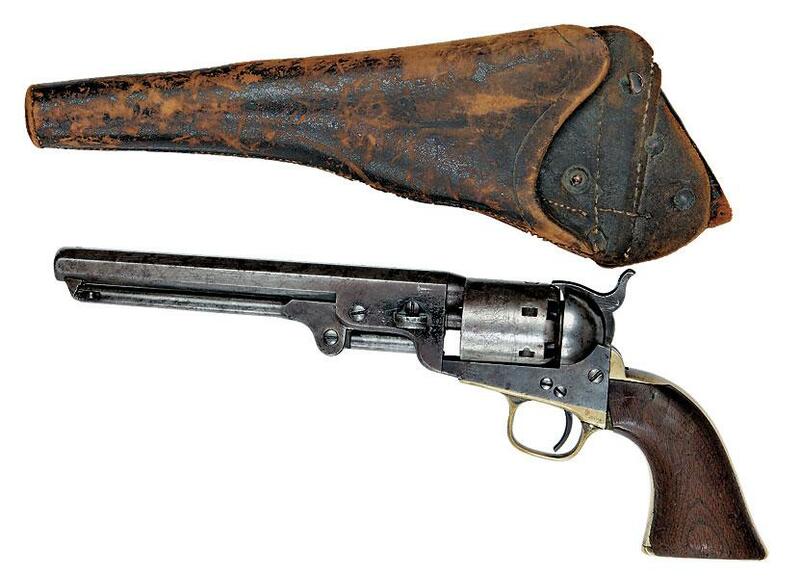 This well-used 1851 Navy Colt and accompanying cut-down military holster came with a handwritten letter from Hardin’s cousin Joe Clements. Joe wrote to his daughter, Amanda, that Hardin gave him the .36 caliber six-gun after Joe had broken up a fight in Gonzales, Texas. 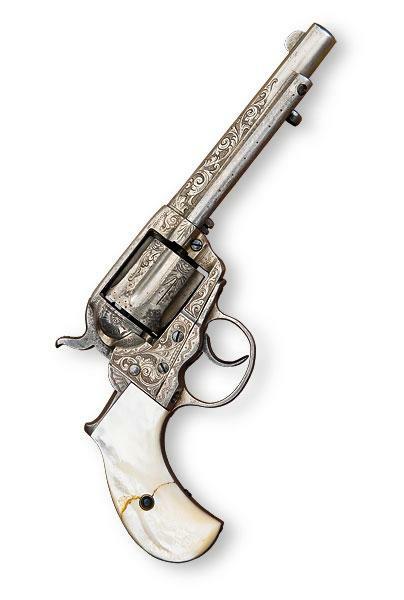 This five-inch barreled, nickeled and engraved, pearl-handled .41 Colt “Thunderer” was taken from Hardin in May 1895 by Deputy Sheriff Will Ten Eyck for “unlawfully carrying a pistol” in the Gem Saloon in El Paso, Texas. It was never returned to him, and Ten Eyck later repaired the cracked grip. A deadly duo of six-guns! 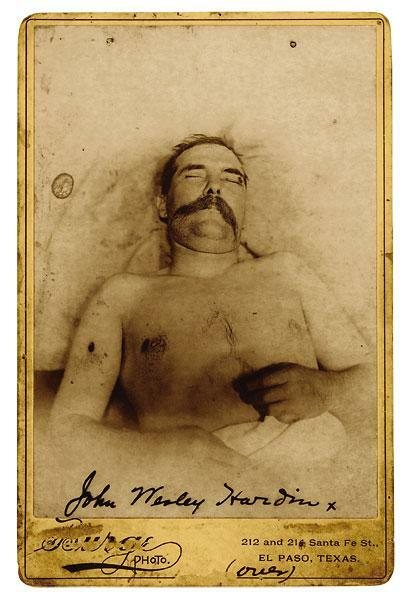 At top is the Smith & Wesson .44-40 Frontier Double Action revolver taken from Hardin’s body (next slide) after he was shot by Constable John Selman (inset). 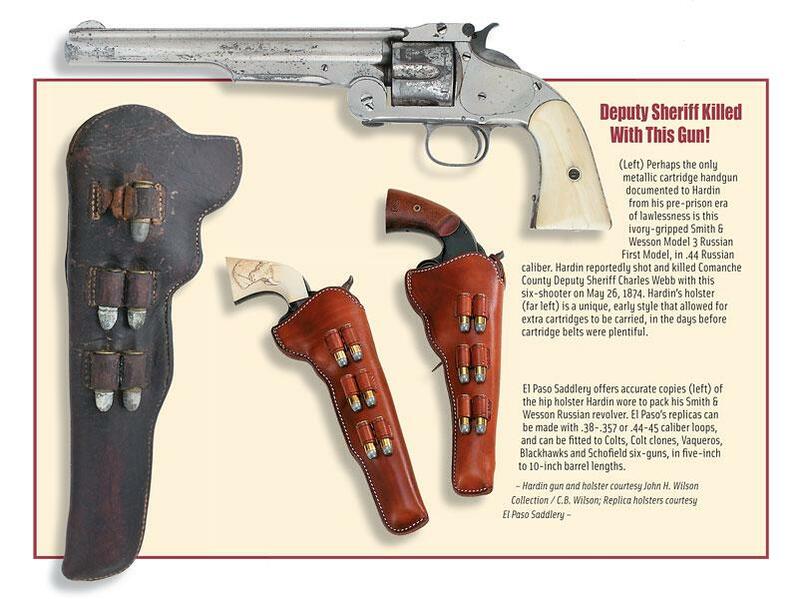 Selman used the 1873 Colt Single Action .45 (above) to end the life of one of the West’s most notorious and dangerous shootists. 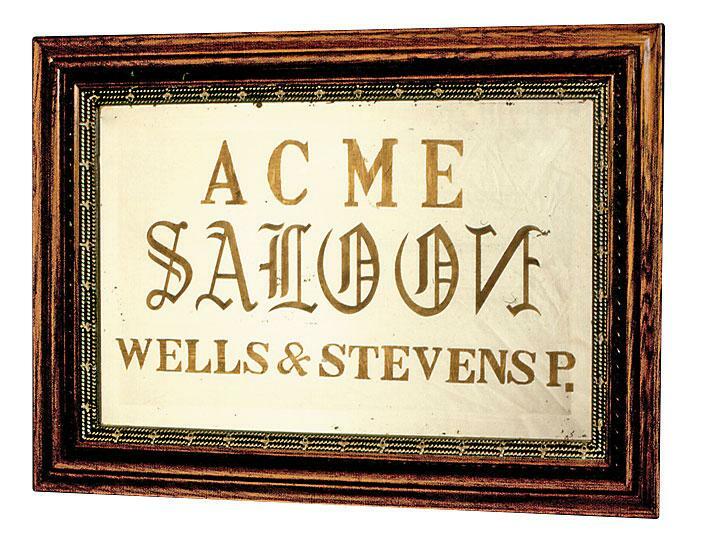 This mirror was hanging in El Paso’s Acme Saloon the night of August 19, 1895, when Constable John Selman killed John Wesley Hardin. Hardin was reportedly facing the mirror, rolling dice for drinks. His last words were “You have four sixes to beat.” The bullet that went through Hardin’s head supposedly bounced off of this mirror and was recovered. Phil Spangenberger believes that Hardin used his .41 caliber Double Action 1877 Colts to shoot holes through faro cards during shooting exhibitions. 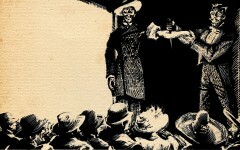 This illustration, by noted artist R.J. Onderdonk, was created for John Wesley Hardin’s autobiography. It shows Hardin and his accomplice, Jim Taylor, gunning down Sheriff Jack Helm. Hardin used a 12-gauge caplock shotgun to broadside Helm; then Taylor fired several shots into Helms’s head with his six-gun. 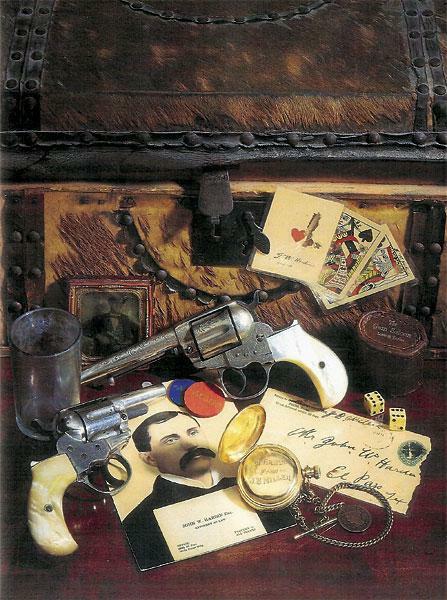 Displayed with assorted John Wesley Hardin memorabilia—including playing cards that Hardin shot and signed, original photos, a business card, gambling paraphernalia and a pocket watch presented to him by his cousin by marriage, “Killin’” Jim Miller—are two of Hardin’s personal weapons—(top) his five-inch, engraved and pearl-gripped .41 Colt “Thunderer,” taken in an arrest, and the 2 ½-inch, pearl-stocked, ejectorless .38 Colt “Lightning” Miller gave Hardin. Both were sold at auction in 1996. The Cowboy Artist Star Joe Beeler helped pave the path for artists whose works sell in the millions today.